In May 1915, a Canadian officer serving as a gunner and physician on the Western Front, Lt. Colonel John McCrea, wrote a poem that has resonated around the globe for a century. The poem was written in the form of a rondeau, a short verse form of medieval France which is usually split into two halves and often set to music. The poem was written on the battlefield in the back of an ambulance, to mark the death of McCrea’s friend and fellow soldier, Alex Heimer, killed during the second battle of Ypres. McCrea had noted, as had all soldiers fighting in Flanders, the profusion of poppies growing over the graves of the fallen, a result of the damage caused to the fertility of soil in the region by continuous artillery bombardment, which had the effect of increasing the lime content of the earth and thereby the blood red poppies to be one of the few wild flowers to grow in the battle-scarred landscape. The poem is written from the imagined point of view of those recently killed, a literary concept used by other poets such as Kipling and Wilfred Owen. It was written in the second year of the war, before the romanticised view of war and the idea of heroic purity of death in battle (a favourite theme of the English public school and Edwardian society in general) had turned to bitterness and disillusion. The first nine lines of the poem beginning, “In Flanders fields the poppies blow / between the crosses row on row,” expresses the sorrow and pain felt for the death of friends and comrades. The simplicity of the language is a perfect vehicle for McCrae’s grief, whilst the last verses of the poem, “Take up our quarrel with the foe / with failing hands we throw the torch,” expresses a very different sentiment, deeply felt by McCrea himself: his belief in king and country and the virtue of empire in a just and righteous struggle. This was a sentiment common to the majority of the young, well educated, privileged officers destined to die for such ideals. The lines also echo the Edwardian belief in the mystical union between the living and those who were privileged to have died in battle. In Flanders Fields, first published in Punch on December 8th, 1915, was the most popular poem of its age, having universal appeal and inspiring men to do their duty. It was quickly used as propaganda to sell war bonds. As the early patriotism of young men waned, the last three stanzas of the poem overshadowed the requiem for the dead and emphasised its dubious patriotic message. 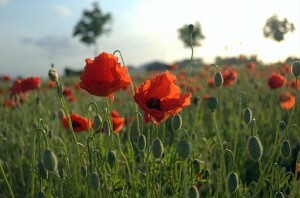 Nevertheless, its sentiments still resonate in the remembrance services held on Armistice Day (November 11th), the lowering of flags and the sound of the bugle playing the “Last Post”, the wearing of the poppy are genuine sentiments of sorrow and respect for all those who have lost their lives in futile wars.